The principle behind cryo preservation is to protect and maintain a sample in a native-like condition. Proteins and complexes are frozen after extensive purification and activity are verified. Vitrification allows for ice to be in a glass-like state. Cubic or hexagonal ice could distort the structure and prevent data interpretation. CryoEM data processing relies on averaging thousands of nearly identical particles, thus the need for homogeneity and monodispersity in the sample. Samples are preserved in a glass-like state (vitrified) by quickly dunking (plunging) them into a cryogen. Typically ethane, propane, or a mixture of ethane/propane are used as cryogens. Liquid nitrogen isn’t used as a cryogen due to its low heat capacity (when the sample is dunked, some of it immediately boils off, creating hexagonal ice … and this is not good). Specialized sample holders are used to perform data collection. EM grids are loaded onto these holders, in the presence of liquid nitrogen. Compared to the continuous film of carbon used in negative stain EM grids, cryoEM grids have small holes in them (anywhere from 1.2-4 microns diameter/hole). 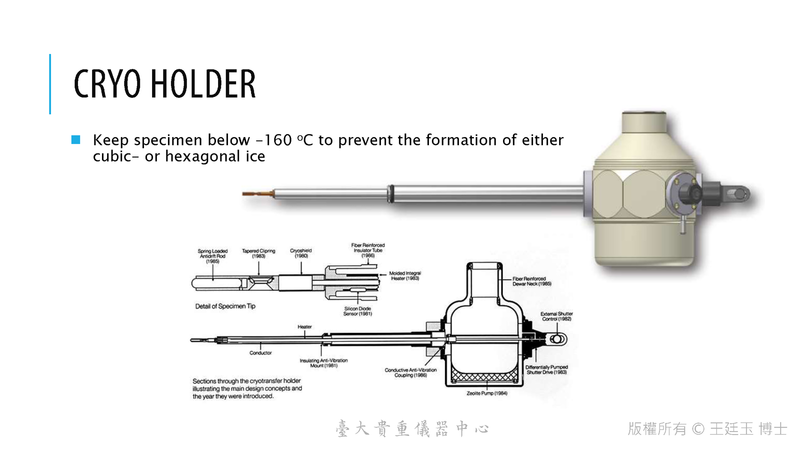 The goal of cryoEM sample preparation is to coax the particles into those holes and take pictures of the sample in the holes. This way, we’re only imaging the sample of interest over ice enhancing sample contrast (cryoEM samples don’t show good contrast compared stained specimens). At CCMR, we have access to cryo holders for single particle analysis (SPA) and tomography, therefore a host of different modalities of data collection can be performed. As in negative stain EM, we have access to plasma cleaning/glow discharge units, plunge freezing devices (manual and automated), and cryogens (ethane, propane and ethane/propane mix) for sample preparation.